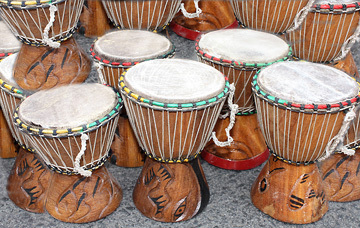 The Djembe drum is an old communication device. This instrument is one of the oldest if not the oldest form of African communication. The drum was used to signal others from great distances, often in a network of drummers, relaying messages of urgency throughout the continent. When Africans were enslaved and brought to America, those that survived, were forbidden to make or use drums for their captors knew of its power in the hands of Africans. Our drums are hand carved from Jala wood that creates the best possible sound. Our drums are for playing they do not cater to the tourist crowd. The goat skin drum heads are perfectly fitted and the over all craftsmanship is superb! These small workable Djembe drums are excellent for small children experiencing their first musicial instrument! They also serve as perfect African decor accents. Please click photo for enlargement! Dimensions: The heights range from 6 to 7 inches tall with a drum head diameter that will range between 5 and 5 1/2 inches across.